Worship is at the core of who we are at First Presbyterian Church of Port Jefferson. We gather for this celebration each Sunday at 10:00 a.m., September through June, (and at 9:30 a.m., July and August). We are a congregation known for its hospitality, openness, and faithfulness. We are a community of believers that celebrates the gift of life together in song, prayer and praise. Children are a very welcomed part of our worship and have their own unique portion of the service, and kids love it here. They stay with their parents for the first half of the worship hour and, after the Children's Sermon, they leave to attend Church School until 11:30 September through June. This allows parents time after church for coffee and fellowship during the fellowship hour. We worship in a spirit of “relaxed reverence” where the attitude of our hearts is more important than the clothing we wear (attire is relaxed as well.) Come join us; you’re welcome here. 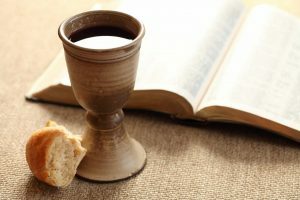 The Sacrament of the Lord's Supper is celebrated on the first Sunday of each month and Maundy Thursday. All baptized Christians are welcome to receive this sacrament, whether or not they are members of our church. Every Second Sunday is our Blended Worship Service. An acoustic guitar mixed with electric bass, piano and some modern joyous singing as power-point projection brings the words to life. Special services during the year also include the Services on Ash Wednesday, Maundy Thursday, Easter Sunday, Memorial Day Sunday, Mother's Day, Father's Day, Scout Sunday, the Blessing of the Animals service, appreciation of Church School Staff Sunday service, and the Christmas Eve Family Candlelight Service. Every Sunday worship is a special celebration of the glory of God and God's son, Jesus Christ. All are welcome to worship with us. Because we believe in the acceptance of all humankind as children of God and because our language never adequately expresses the nature of God, our services use inclusive language. For those who desire to use inclusive language, alternative versions of the Gloria Patri and Doxology are printed in each bulletin. Our numbers in worship are growing! The wonderful problem this creates is the need for tighter seating on Sunday mornings. When you take your seat, please move to the center of the pew to allow more people to sit beside you. Our church is using the new hymnals(Glory to God). There are also electronic aids for the hearing impaired available; ask an usher to help you if you need these. If you have an announcement or prayer request, please raise your hand and wait for an usher to come to you with a microphone. When making your announcement or request, please hold the microphone close and speak directly into it so you will be heard.